GoodReads Summary: Tommy bounces, and he leaps. Tommy clomps, and he bulldozes. Nothing tires Tommy out, and his family can't keep up! But then his sister has an idea: could tap class be just right for Tommy? 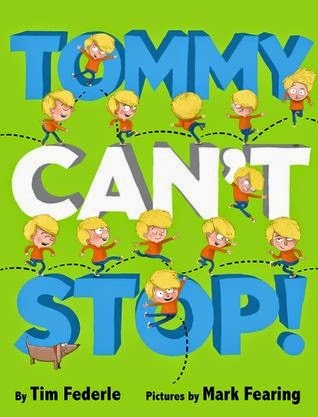 This exuberant picture book, written by Broadway dancer Tim Federle, with illustrations by Mark Fearing, stars one very energetic kid who finally finds his place in the spotlight. What I Think: I'm sure any reader will be able to think of someone they know who is just like Tommy! Tommy has a great family who try to help him with his non-stop-ness. I know movement is so important to kids so I think it's great that they do support him...even though it tires them out! I hope some adults read this and remember how much kids need to move. he boasts when he bounces. 'I'm a bulldozer! he clamors when he kicks." Writing Prompts: Write about a time when you had to wait for something and you had to work so hard to keep still. What did you do to help manage your wiggles? What are some ideas for things you might do that others might not notice?